The is the Shelby County Bicentennial postcrad’s post mark for Anna. This is the front of the postcard honoring Sidney as part of the Shelby County Bicentennial celebration. This is the back of the postcard honoring Sidney as part of the Shelby County Bicentennial celebration. SIDNEY — A special pictorial postmark has been created for each of the 11 communities in Shelby County that has a post office (Anna, Botkins, Fort Loramie, Houston, Jackson Center, Kettlersville, Maplewood, Pemberton, Port Jefferson, Russia and Sidney). 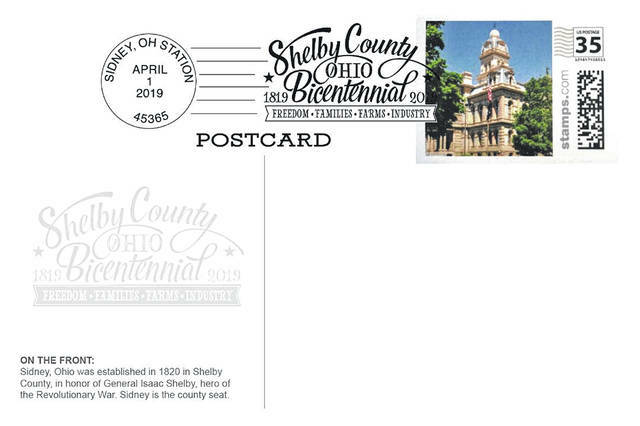 Each postmark features the official Shelby County Bicentennial logo, the April 1, 2019 Bicentennial date and the location of that post office as the official place of mailing (ex. Anna, Ohio, station). To celebrate the 200th year of Shelby County, on April 1 customers at any of the county post offices can request to have the postage on their regular outgoing mail cancelled with their community’s special postmark. Commemorative postcards can be specially postmarked on request and mailed on this date as well. Eleven unique commemorative postcards have been designed. The front of each 4-inch by 6-inch postcard features high-quality images of each community. The back of the postcard includes one custom postcard-rate postage stamp featuring a photograph of the current Shelby County Courthouse. Most postcards will also come pre-stamped with a special bicentennial pictorial postmark. A set of all 11 postcards sells for $20. Individual postcards are priced at $2 each. Postcards will be available for purchase beginning April 1 through April 30 at the following retail locations during their regular business hours: Rachel’s Cakes in Anna, Ask Amy Staging in Botkins, Fort Loramie Hardware, Michael’s Mowers in Houston, Jackson Center Pro Hardware, PJ General Store & Carry Out in Port Jefferson, Buschur’s Market in Russia, and The Ivy Garland in Sidney. Each retail location will have on-hand their community’s individual postcard, as well as the 11-postcard sets. As there are no retail locations participating in Kettlersville, Maplewood and Pemberton, those interested cards representing these communities can purchase their cards at: Rachel’s Cakes will also carry the Kettlersville postcard; PJ General Store & Carry Out will carry the Maplewood postcard; and The Ivy Garland will carry the Pemberton postcard. As a fun way to observe the bicentennial celebration, a limited number of commemorative postcard sets will be available for purchase without postmarks. Those who choose to purchase their postcards in this format can instead plan to visit each of the 11 post offices in the county during the month of April and collect their own postmarks. The commemorative postcards are intended as bicentennial keepsakes, however, they have a stamp and meet all requirements for mailing. Anyone wishing to mail a commemorative postcard bearing the special April 1, 2019, postmark must do so on that date only. After that date, postcards containing the special postmark can no longer enter the mail stream, per postal service regulations. https://www.sidneydailynews.com/wp-content/uploads/sites/47/2019/03/web1_AnnaPostmark.jpgThe is the Shelby County Bicentennial postcrad’s post mark for Anna. 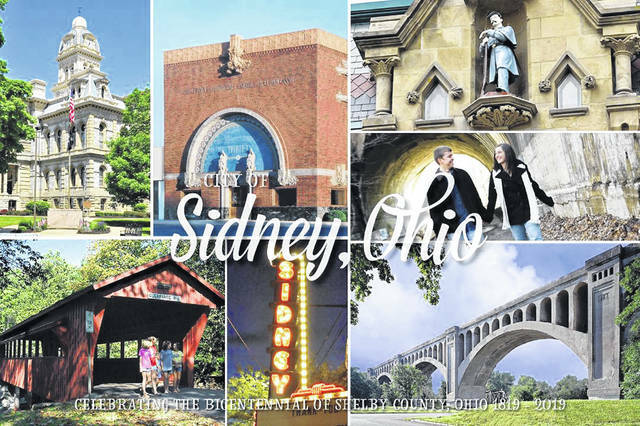 https://www.sidneydailynews.com/wp-content/uploads/sites/47/2019/03/web1_PostCard.jpgThis is the front of the postcard honoring Sidney as part of the Shelby County Bicentennial celebration. https://www.sidneydailynews.com/wp-content/uploads/sites/47/2019/03/web1_PostCardBack.jpgThis is the back of the postcard honoring Sidney as part of the Shelby County Bicentennial celebration.